BOOM! Studios turns ten this year. That's cause for celebration and at SDCC 2015, BOOM! (along with KaBOOM!, BOOM! Box and Archaia) will be throwing down in style for their tenth straight year at the show. BOOM! can be found at Booth #2229 on the show floor and will host an army of talent for signings, including appearances by Alyssa Milano, Bruce Boxleitner, Bryan Cranston, Seth Green, David Petersen, Mark Waid, Frank Barbiere, James Tynion IV, Noelle Stevenson, Rebecca Sugar, Asaf Hanuka and many more. BOOM! will also host its 10th Annual Comic-Con drink-up, which has been renamed the BOOM! 10 Year Birthday Bash to celebrate 10 years of publishing. For $30, fans can request and purchase custom sketches to be drawn on blank Get-A-Sketch covers at the show. Fans can also pre-order sketches in advance starting now on the BOOM! website and pick them up at the show. Supplies are limited so act now. The Lumberjanes sketch cover from Carolyn Nowak can be pre-odered here, Adventure Time, Bravest Warriors, Bee and Puppycat or Steven Universe from Ian McGinty can be pre-ordered here and Adventure Time, Bee and Puppycat, Steven Universe or The Amazing World of Gumball from Travis Hill can be pre-ordered here. BOOM! will also be holding its 10 Year Birthday Bash at the Odysea Bar, located inside the Hilton Bayfront Hotel at 1 Park Boulevard, two blocks south of the Convention Center, on Thursday, July 10, from 9 PM to close. It's open to the public and no RSVP is required. Full press release and signing/panel schedules below. June 29, 2014 (Los Angeles, CA) - Award-winning comic book publisher BOOM! Studios and its imprints, KaBOOM!, BOOM! Box, and Archaia, announced today it will return to exhibit for the 10th straight year at Comic-Con International in San Diego, to be held at the San Diego Convention Center in San Diego, California July 8-12, 2015. BOOM! can be found at Booth #2229 on the show floor and will host an army of talent for signings, including appearances by Alyssa Milano, Bruce Boxleitner, Bryan Cranston, Seth Green, David Petersen, Mark Waid, Frank Barbiere, James Tynion IV, Noelle Stevenson, Rebecca Sugar, Asaf Hanuka, and many more. BOOM! 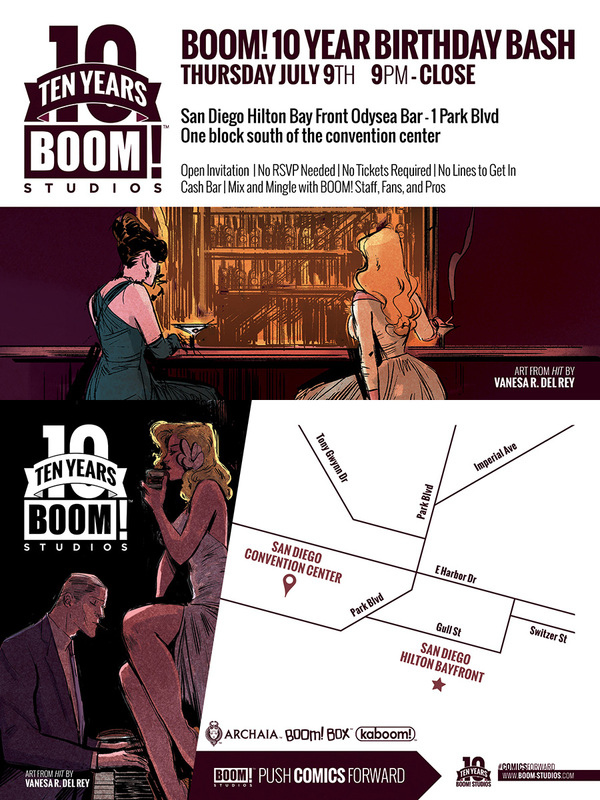 will also host its 10th Annual Comic-Con drink-up, which has been renamed the BOOM! 10 Year Birthday Bash to celebrate 10 years of publishing. For $30, fans can request and purchase custom sketches to be drawn on blank Get-A-Sketch covers at the show. Fans can also pre-order sketches in advance starting now on the BOOM! website and pick them up at the show. Supplies are limited so act now! To pre-order a LUMBERJANES sketch on our brand-new LUMBERJANES sketch covers from Carolyn Nowak, go to http://bit.ly/LJSketch. To pre-order an ADVENTURE TIME, BRAVEST WARRIORS, BEE AND PUPPYCAT or STEVEN UNIVERSE sketch from Ian McGinty, go to http://bit.ly/Iansketch. To pre-order an ADVENTURE TIME, BEE AND PUPPYCAT, STEVEN UNIVERSE, or THE AMAZING WORLD OF GUMBALL sketch from Travis Hill, go to http://bit.ly/TravisSketch. The following signing events are TICKETED. Tickets are FREE (though purchase of an item to be signed may be required) and are available for pick up on a first-come, first-served basis on the morning of the signing. Stoopid Buddy Stoodios creators and members of the voice cast of the upcoming Crackle animated stop-motion comedy series will be signing FREE copies of the “SuperMansion” San Diego Comic-Con Exclusive comic book. Olivia Olson, the voice of Marceline on the Adventure Time animated series, will be on hand to sign Adventure Time comics! Creators and cast members of the cast will be signing copies of the Lantern City #2 San Diego Comic-Con Variant ($10) and other Lantern City products. The creator and writers will be signing copies of the Hacktivist Vol. 2 #1 San Diego Comic-Con Variant ($10) and other Hacktivist products. On Thursday, July 10th from 9pm until close, BOOM! Studios will hold its 10 Year Birthday Bash at the Odysea Bar, located inside the Hilton Bayfront Hotel at 1 Park Boulevard, two blocks south of the Convention Center. It is open to the public and no RSVP is required. Additional details about BOOM! Studios Panels and Exclusives will be released shortly. For more information on San Diego Comic-Con, visit their website at http://www.comic-con.org/cci.